Frames from a nucleus hive ready to be smoked before moving them into a new bee box. Bee larvae can be seen in the center of the photograph. 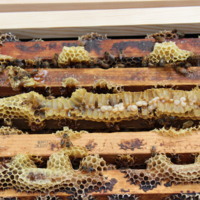 Susan Winkler, “Apiculture Initiative: Nucleus Hive Frames,” Raíces Cultural Center Digital Archive, accessed April 24, 2019, http://www.raicesculturalcenter.org/digital-archive/items/show/342.